Seagrape is a native of Tropical America. It can be seen in coastal hammocks, coastal scrub, coastal grasslands and beach strands from North Argentina throughout the West Indies and the Florida Keys to Pinellas County on the Gulf Coast and southern Volusia County on the Atlantic Coast of Florida. Basically, it is a tree capable of growing in nature upto a height of 50 ft under favourable environment. But it is not able t get its tree stature at most of its locations because of sandy soils and poor nutrient supply. It widely planted a road side tree, a wind break tree or as hedge in gardens. This is a very common plant in Rio de Janeiro, mostly planted along the oceanic avenues. Though the fruits are edible and used, but still it is planted for other purposes than a fruit tree. Seagrape is a handsome vase-shaped evergreen tree growing up to 50 ft (15.2 m) tall; leaves are leathery, rounded with heart-shaped bases, bright green, often veined in red and are about 8 in (20.3 cm) in diameter. The fruits are globose to pear-shaped, about 3/4 of an inch long (2 cm), and range from dark purple, to purple, to occasionally off white. The fruit surface is velvety. The fruits hang down in grape-like clusters. That is probably the reason for the name “seagrape”. Seagrape can be planted at location in partial shade as well as in full son. Though the plant is drought tolerant, but when planted in gardens as a hedge, it would require frequent irrigation. Its plants can be raised from seed or ground layering. The fruits taste subacid and are eaten raw. These are also made into an excellent jelly. 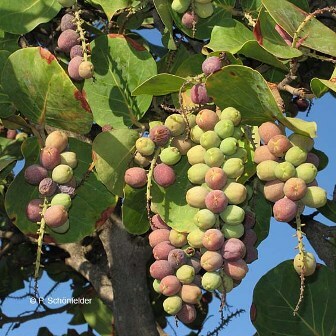 A wine is also prepared from seagrape fruits in the West Indies. 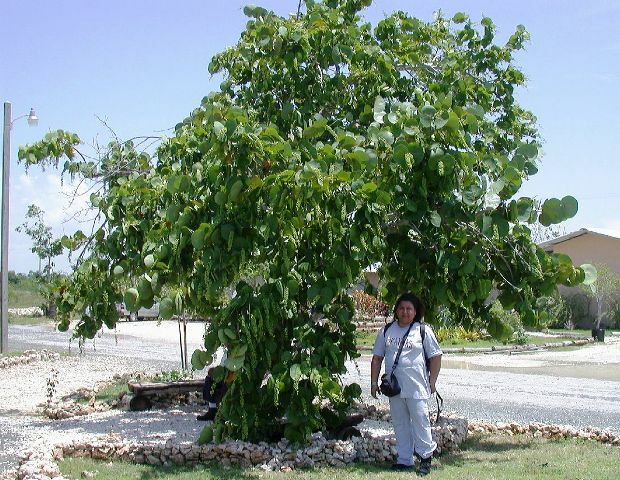 In the West Indies, they prepare a red dye by boiling the seagrape tree wood in water. Wood from larger trees is prized for cabinet work. 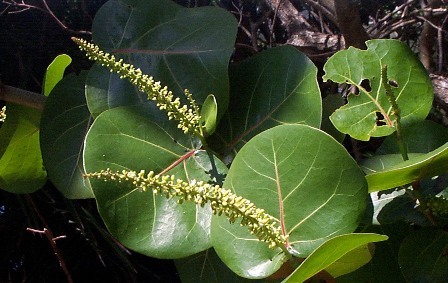 A gum from the seagrape bark is used for throat ailments. The roots are used to treat dysentery.